Invacare Mariner rehab shower commode chair offers rust-resistant aluminum frames and stainless steel hardware, which make them ideal for use in the shower. In addition, mariner shower commode chair fit over most standard and elongated bowls for over the toilet use as well. Mariner rehab shower commode chair feature flip-back padded arms that lock down for safety, swing-away front riggings with tool-free adjustable height footrests and a four-position padded seat. 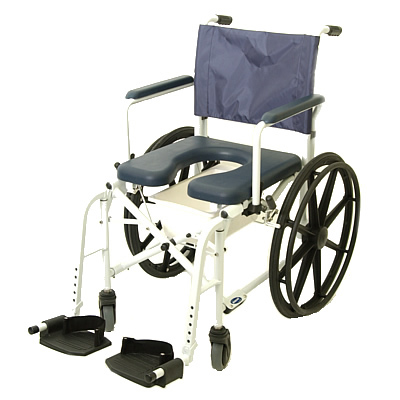 Mariner commode chair offers various seat widths and wheel options for a custom fit along with additional features and benefits. Width between arms 18.5" 16.5" 18.5"
Width folded 12" 12" 8"
Seat dimensions 18.25" x 18.25" 16" x 16" 18.25" x 18.25"
Seat-to-floor height 22.75" 22.5" 22.75"
Seat-to-arm height 8" 8" 8"
Footrest extensions 13" - 18" 13" - 18" 13" - 18"
Weight 41 lbs. 39 lbs. 32 lbs.